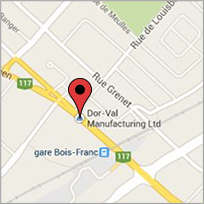 Dor-Val Mfg. Ltd has been a leader in the manufacture and supply of commercial furniture to the North American Health Care and Hospitality industries since 1971. Dor-Val is constantly leading by innovation. Check out our anti-microbial, mark resistant wood finish, our new “chair saver” molding, and our other unique solutions to the every day problems that occur in Senior Living. If you don’t find what you are looking for in our line, ask us. We thrive on our ability to meet our clients expectations either by modifying an existing product or with custom manufacturing. Our products have been designed and built for the senior care market. They are not existing products given a new number, they are built for our market. Denser foam, brush outs, overhanging arms, flow through soft seating construction, radius corners, anti-microbial finishes, are just some of the standard features built into our products. Our philosophy is simple: deliver quality products on time at fair prices and if something goes wrong, fix it. We strive to provide maximum value to our customers. Dor-Val supplies a complete furniture package to the Senior Living industry. We provide specialized furniture for everything, from the bench at the front door to the dining rooms, resident rooms, lounges, hallways, activity rooms, theaters, chapels, outdoor furniture, and even the beauty salon. both metal and wood chairs, but also custom booth and banquet seating, fully upholstered soft seating, dining and occasional tables, and specialty products such as mid walls, maitre'd stations and service stations. Additionally, we furnish lobbies, funeral homes, arenas, universities, malls and banquet halls. In short we produce and sell just about every category of commercial furniture. Despite having thousands of products in our catalogues and on this web site, over half of our business is in custom furniture. This can take the form of modifying an existing model to making a custom piece of furniture from a picture or drawing or anywhere in between.